ECPM has started a new training programme designed to reach high school and college students in partnership with the local churches that are situated near school campuses. The thrust is to help churches establish campus ministry and at the same time assist them in training their youth leaders. This is a one-year and two-year training programme for teams of youth campus leaders composed of 2 to 3 members. The prospective team members are Christian students studying in the target school. These training programmes establish a team to work on university campuses. Youth in Missions for Christ visit the campuses, run evangelistic events and Bible studies and disciple people who respond. They work in cooperation with local churches. They often use sports events to gather people together and develop fellowship groups. They initially started with a pilot test of campus ministry in the University of Rizal System, in Morong Rizal. Following this, in the June 2007-March 2008 school year two new campus ministries were started. One is in Puerto Prinsesa, Palawan, which was started in partnership with the church in Brookes Point, Palawan, where most of their youth members studied in Puerto Prinsesa and rarely returned home because of the high cost of transportation. It would take almost five hours to travel from Puerto Prinsesa City to Brookes Point. The other campus ministry is in Tarlac State University in Tarlac City (located in the northern part of the Philippines). This ministry is in partnership with San Rafael Gospel Chapel in Tarlac City. All four team members come from the same church. Two of the campus ministry team members had been actively involved in campus ministry prior to their partnership with ECPM. Both campus teams believe that they can inspire more and more students and they have started building relationships with other Christians on campus. The teams are aiming to grow alongside the young Christians and together help other students encounter Christ. Bright Hope World has supported various ministries associated with ECPM for many years as a result of Len and Mary Savill's (NZ missionaries) association with ECPM. In 2006 we were approached regarding this new venture they were looking to start, reaching out into universities with the gospel of Christ. This project provides financial support for the team leaders of the two campus ministries. ECPM has realised the importance of youth in growing God's kingdom and has taken the initiative to implement not only programmes in the universities to reach young people but also training programmes for the leaders. We also like the fact that they seek to partner with local churches in this endeavour so the team leaders have spiritual support and new Christians have a local church they can become a part of. 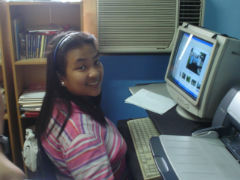 Ella Santos coordinates the YMC Campus Ministry at ECPM (see PHI04). She initially volunteered in different mission activities through the youth programme of ECPM. In 2005 Youth in Missions for Christ was created as the youth missions arm of ECPM and because of her passion to minister among the youth, ECPM asked her to be part of the YMC core that organise and plan the programme for YMC. In 2006, the YMC Campus Ministry was started and Ella took on the role of Coordinator of the Campus Ministry. She now coordinates the training and campus evangelistic activities of the two campus ministry teams. The team members that are involved in running the two campus ministries. As well as the monthly training programmes for the leaders they are keen to start having specialised seminars/training programmes that other young people can attend as well as the leaders. They have a real desire to reach more and more young people for Christ and start more Bible study groups and also to set up teams in three more universities. In Palawan, two members of the team, Liezel and Shera, were inspired to start a Bible study group among their boardmates. Just the thought of other students attending the Bible study gave a glimmer of hope in the lives of these two Christian girls. Jeff, a team leader as well, had always been afraid to lead the team. He said that he would do all the logistic stuff but never the leading part. Since the group voted him as the leader, he has tried to really assert himself and little by little is developing his character, skills and gifts. They are even praying that this campus ministry will open up opportunities for them to start a youth church in the city of Palawan and that they will have a greater part in the kingdom building after they finish their college studies. According to the team members of the Tarlac team, they are greatly inspired by their team leader, Gem. His zealousness to work for God's kingdom has encouraged them to review as well their passion and motives for joining the campus ministry. Sometimes they have struggles regarding when to meet because of their different class schedules but the friendship within the team has enabled them to compromise and meet in the middle when deciding where and when they should hold their team meeing. It is also very encouraging that the partnering church In Tarlac shows a lot of interest, checks how the team is doing and even asks them to report to the congregation their activities on campus and their prayer needs.